Nanning, in Guangxi Province,China now has a new attraction; an Angkor Wat complex. 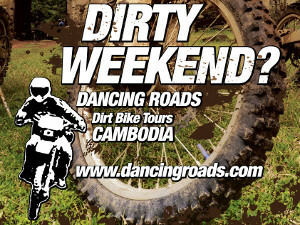 Visitors can’t tell whether they are in Cambodia or Nanning. Nanning is a horrible bloody city, I used to have to spend two weeks there every year for the China + ASEAN secretariat Conference and Expo. Hated it every single time. Wasn't there a big protest from the powers that be about plans for something like this in Bihar, India a few years back? Didn't the French already do this back in the 30's? moethebartender wrote: Didn't the French already do this back in the 30's? They had a couple of temporary expositions in about 1909 and 1931. For some reason, I knew about the '31 expo, but I didn't (or at least I don't remember) reading about the one in 1909. Cheers, always appreciate your knowledge. There was one in Marseille in 1906, not 1909 as I guessed before. France extended its colonial empire in Southeast Asia in the 1860s. The appeal of Angkor Wat, the ancient imperial capital in what is Cambodia today, was described as early as 1858 by the French explorer adventurer Henri Mouhot. The temple precinct would be emulated in world’s-fair pavilions, and came to symbolise the broader geographic region of French Indochina. 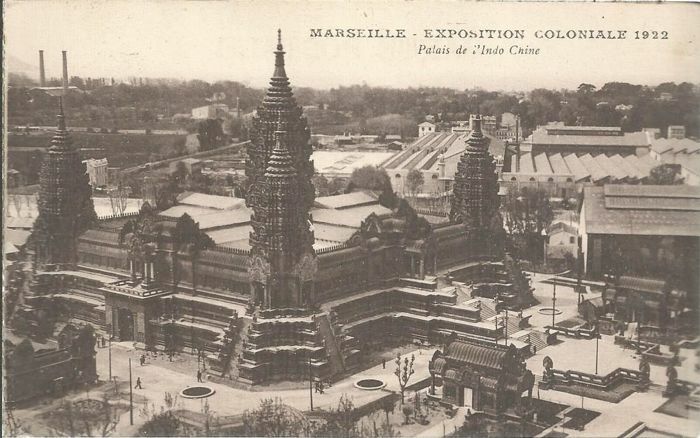 The earliest instances of Indochinese temple pavilions are at Paris’s Exposition Universelle of 1878. Cambodia was present in reproductions of the Phnom Penh temples and models of Khmer sculpture. This 1878 exposition provided a preview of what would turn into the Musée Guimet with objects from India, China, Japan, and Indochina. It was created to ‘protect and highlight an aesthetic patrimony’ (Aimone and Olmo, 1993, p.229). Just as these objects from a vast region were lumped together based on their shared ‘orientalness,’ artistic details in the Indiana Jones ride similarly combine archaeological elements from various regions. Within the Disney temple there are reproductions of Mesopotamian water goddesses from Mari in Syria, copies of Buddhist and Hindu sculptures derived from Indic sources, and a mural of the demonic deity Mara painted in the Calendar Room rotunda inspired by Ajanta cave paintings. But unlike the nascent Musée Guimet that sought visitors’ attention for didactic purposes, the reason for the excessive detail in the interior sections of the Disney temple is to entertain and entice otherwise impatient visitors to walk a quarter mile to the loading dock to start the ride. Thus, ‘because the journey takes place indoors [...] architecture is the attraction [...]. The building is both the story and the means of telling it’ (Marling, 1997, p.114). So too did Angkor Wat reproductions at world’s fairs have a twofold formal and functional purpose, with the building’s regionalist architecture on the outside serving as a display venue for the objects inside. Paris’s 1889 exposition included a Phnom Penh pavilion inspired by Khmer art, and included the famous monumental ensemble of Angkor Wat. ‘The Pagoda of Angkor’ was part of the Pavillon de Cambodge in the Invalides section and contained sculptures from casts taken on site (1889: la Tour Eiffel 1989). 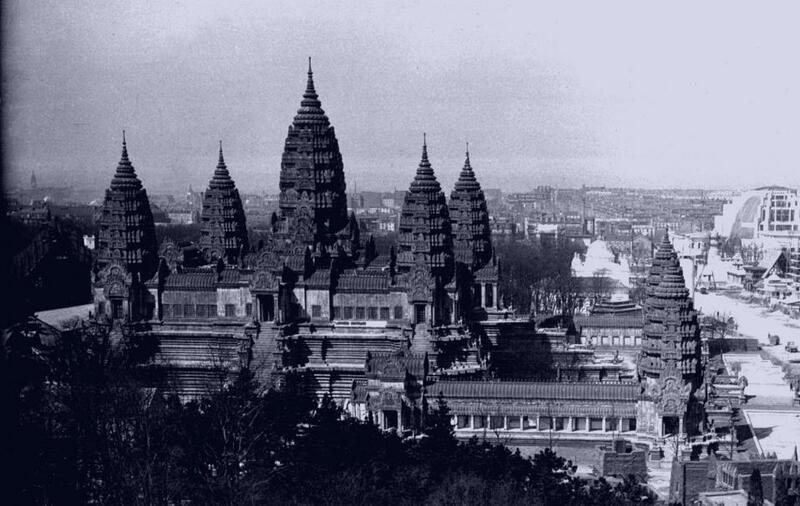 The 1900 Paris exposition was dominated by a towering model of Angkor Wat that would appear again in the 1906 and 1922 Marseilles expositions and in the 1931 International Colonial Exposition in Paris. This 1931 Angkor Wat temple-pavilion (Figure 4.3) spatially dominated the fair, taking up a tenth of the Vincennes site. Lauded for its accuracy and stature, the replica was ‘probably the most impressive colonial pavilion’ (Findling and Pelle, 2008, Paris 1931 entry). For all its authenticity, however, the historian of American popular culture, taste, and architecture Pat Morton has studied this structure, and reminds us that ‘the very process of translating non-Western cultures into representations that were legible to Western audiences produced hybrid, impure images’ regardless of the professed maintenance of accuracy (Morton, 1998, p.84). Despite differences in source material and geography, the temple-pavilions and the Disney temple combine fact with fiction. Outside of the fantastical realm of the ride’s narrative and seemingly grounded in reality, the art director of the Indiana Jones ride Skip Lange has stated that the influence for the Disney temple came from National Geographic magazines of the 1930s. 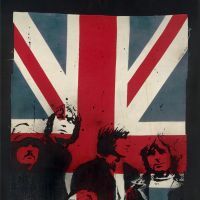 In a televised interview from 1995, Lange has said that the designers of the project would ‘look at things and see, oh! That’s what the temples looked like in India and Cambodia and things like that so that we are really seeing this as accurate[ly] as possible’ (‘The Making of Disneyland’s Indiana Jones Adventure’). Early concept art and drawings for the ride used Cambodian architectural forms, and ostensibly substantiate this claim. As the conscious or unconscious inheritor of traditions laid down by the pavilion-temples, Marling is correct to mention the ‘Mayan and Cambodian details’ influencing the Disney temple, as were discussed earlier. Outwardly, though, the Disney temple bears the strongest affinity to Hindu temples in Tamil Nadu. As such, the architectural representation of India in colonial displays will now be discussed. The 1906 one was in Marseille, that's the 1931 Paris one in the photo. I'm amazed by Psah Thmei in the background though! There were quite a few of these apparently, the 1906 Marseille one, one in 1907 in Paris, another in 1922 in Marseille and then the last French ones in 1931 and 1937. 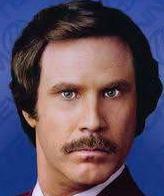 Yeah, something of an anomaly. I thinking now that is actually a pavilion, not a Phsar Thmei exhibit and perhaps the market was styled off that, being that the below pic is 1931 - the market was built in Phnom Penh1935-7- and as there was yet another expo in 1937, I initially thought that Phsar Thmei was an exhibit at the '37 show. 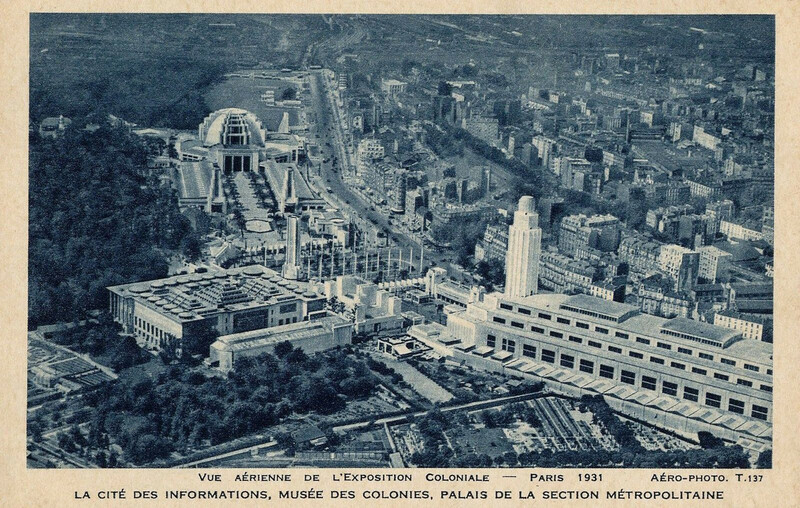 The French love an expo; they put on another one in 1928.